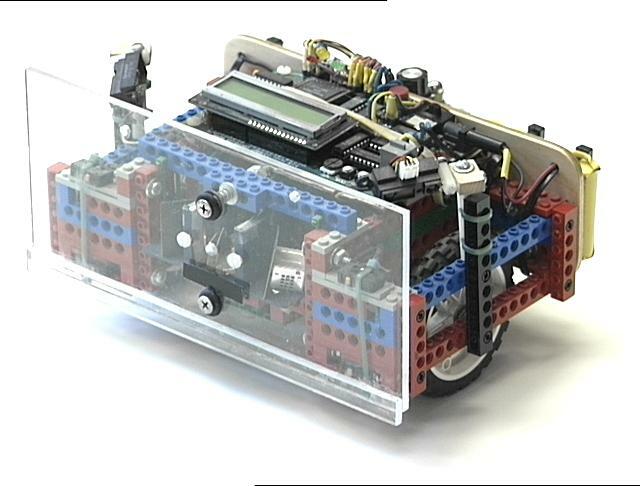 Update: 04 April 2004: A Can Collecting Module for LegoBot. Update: 21 March 2004: A Firefighting Module for LegoBot. 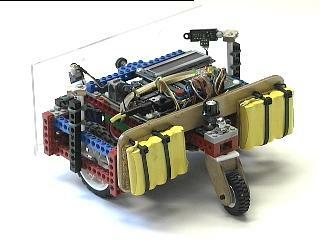 The Legobot is constructed from my sons' Lego Technics set and has used several different micro-controllers. In the present incarnation its brain is a Motorola HC11 running in an M.I.T. 6.270 board. This is the same type of controller we're using on SR04 and Nbot, without the extra expansion board. For a Lego enthusiast this is not a pure Lego design, as we have incorporated an aircraft plywood spine to strengthen the battery supports, and judicious application of plastic cable ties at various points in the chassis. The inclusion of these structural members has provided a robust platform that has remained rigid and functional for more than three years of use and abuse. Power for the motors and microcontroller is provided by ten 1600 mAh NiMH cells split into two five-cell packs. The packs are mounted on the plywood spine on either side of the tail wheel. This mounting arrangement serves to locate the robot's center of gravity about one inch behind the main drive wheels and so prevents the robot from tipping forward on it's nose during rapid maneuvers, while still providing enough weight on the main wheels to insure good traction. 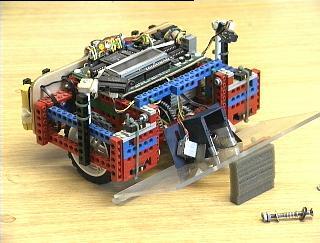 The robot uses a dual differential drive mechanism for propulsion and steering. A pair of Lego motors and three sets of 40:8 gears provides a 125:1 gear reduction. The spur gears that are driven directly by the motors have 32 segment black-and-white encoder patterns glued to the gears. These are read optically, similar to the home brew shaft encoders, to provide motor feedback for velocity control and position calculations, commonly referred to as "odometry." The Hamamatsu photo reflector optical elements are attached to the plywood strut connecting the two green Lego blocks, which can been seen in the above image situated just between the two output shafts. The drive wheels are balanced by a non-driven castering tail wheel. It is constructed from a small Lego wheel and two plywood side panels. A Teflon bearing surface on the top is held in contact with the Lego tail struts using a steel bolt and a chrome acorn nut. 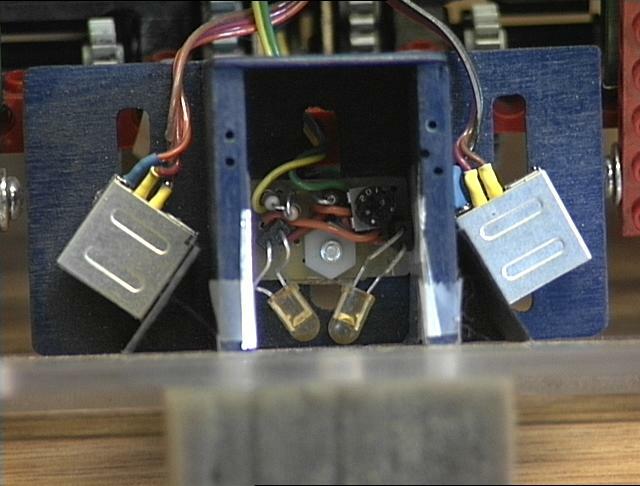 A knob used for inputting software parameters can be seen just in front of the tail wheel assembly, mounted behind the plywood spine. The LegoBot has four sets of sensors which it uses for autonomous navigation. The optical shaft encoders described above provide the raw data for location (X,Y) and rotations (Theta) in inches and degrees, respectively. Using these the robot can keep track of its position and navigate toward a target, or a list of targets. Most of the contest behaviors which the robot can do utilize this navigation ability in one way or another. Here is an mpeg movie of a simple navigation exercise. The robot has a single target, 8 feet directly ahead. When it arrives at the target it slows down and comes to a halt, pivots 180 degrees to face the starting point, and then returns to the starting point, and rotates back to its original heading. This exercise could also be accomplished with more traditional robot dead reckoning, or even more simply by a timing pattern. However the robot is tracking its location 20 times per second and re-calculating the shortest path to the target each time. This is more apparent when the other sensors become active. A second set of sensors consists of four microswitches mounted on the front of the chassis that are activated by the clear plastic Lexan front bumper. The bumper is mounted in the center on a pair of spring-loaded bolts. In this way the robot can detect bumper presses on the left, the right, and in the center. In the image above the front bumper has been removed from it's mounting bolts to reveal the location of the microswitches, which are bound in place with green cable ties. The platform's reaction depends on the location of the bumper event. Detections on the right cause the platform to back up slightly and pivot to the left, while detections on the left cause it to back up slightly and pivot to the right. Center detections cause the robot to back away and rotate 90 degrees, left or right as determined by the bumper detection history. The microcontroller keeps a history of the timing and location of the 12 most recent detections, and the robot uses this information to work it's way free from entanglements and complex environmental geometries like chair legs and power cords. Here is another mpeg movie of a slightly more complex navigation exercise. Again the robot has a single target 8 feet directly ahead, but in this case there is an obstacle, the ubiquitous 5-legged office chair. This autonomous navigation problem combines the target acquisition behavior of the odometry with the obstacle avoidance behavior of the bump sensors. The straight line calculations of the first exercise are interrupted by collisions with the chair legs, and the robot's continuous re-calculation of its location and the shortest distance to the target are apparent. The ultimate path the robot travels is considerably longer than 8 feet, and in this case dead-reckoning or timing patterns cannot accomplish the same behavior. The third set of sensors consist of Infrared (IR) emitter and detector pairs mounted in a shadow box behind the front bumper. They are arranged such that they illuminate and detect objects in two overlapping lobes in front of the robot, out to a distance of about 15 inches. In the image above the two IR LEDs are the yellowish objects angled toward each other in the center of the shadow box. The IR detectors are the two silver boxes angled away from center on either side. The elements are mounted and shielded in such a way as to provide two separate fields of view of equal detection strength, with a slight overlap in the center. Visible light indicator leds, green for left and red for right, are mounted on the CPU and are lit when a detection occurs in either or both zones. The reaction of the robot to IR detections is something like that for bumper detections. For a detection on the right the robot steers to its left, and for a detection on the left it steers to its right. When there is an IR detection in the center, the robot slows its forward speed, which then takes some time to build back up. This has the effect of slowing the robot down more and more until it comes to a stop, unable to proceed forward but still able to pivot left or right. This behavior is very effective in avoiding obstacles and maneuvering in a tight space. Here is a third mpeg movie of the robot going forward 8 feet and back while using its IR sensors to avoid a cardboard box. The initial detection of the box pivots the robot around to the right too far to clear the obstacle, and it continues turning right until it no longer detects the desk legs or the wall. At that point it is able to find the shortest distance to the target and navigate between the box and table legs to its goal. A white paper napkin has been placed on the floor to use as a guide for judging the accuracy of the robot's return to the point of origin. Looks like it missed by an inch or two. These three sets of sensors together can allow the robot to operate robustly in a cluttered human environment (which mine always is.) 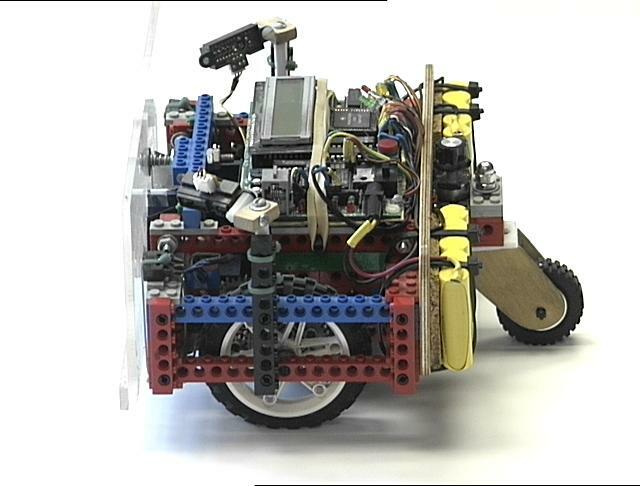 The bumper behavior, as the "sensor of last resort" runs only rarely, but it is necessary to protect the robot from damage and from getting stuck when the other sensors fail. 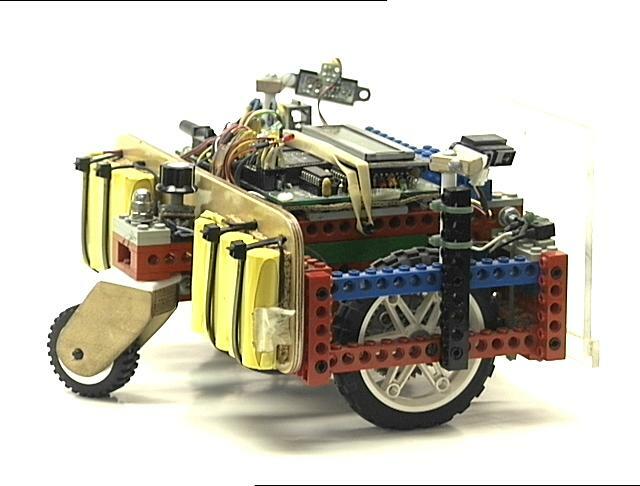 It is exactly the same height and depth as the tallest and lowest components of the robot, so if the bumper clears an obstruction the rest of the robot will also. Here is a somewhat longer mpeg movie of the robot navigating around the same room and avoiding obstacles and entanglements. In this case it is not navigating to a particular target but rather seeking to explore the entire extent of this "unknown" environment. Notice the IR detectors seem to effectively avoid the gray 5-legged office chair but have a hard time with the silver one, calling on the bumper behaviors at least once to get past the "invisible" legs. 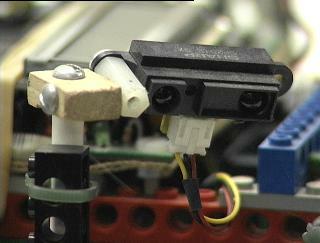 The final set of sensors on the LegoBot are a pair of Sharp GP2D12 IR proximity detectors. These are mounted on uprights with 3-axis pivots directly behind the front bumper on either side. They are angled to point slightly forward, out left and right from center, and down toward the floor. These sensors return an analog voltage proportional to the distance of a small focused spot of IR light projected by the sensor, and are accurate from about 3 inches to around 30 inches. The Legobot uses these sensors to measure the distance to the nearest wall or other objects in order to perform a wall following, or perimeter following, navigation mode. In this wall-following mode the robot's path is directed by a combination of the normal IR detectors and the Sharp proximity detectors. When the distance to the wall becomes too great as measured by the proximity detectors the robot turns toward the wall. This is signaled visually with a blue indicator LED (had to find a use for one of those cool BLUE LEDS!) When the robot approaches too close to the wall the normal IR collision avoidance sensors steer it away. So between the two sets of sensors, the robot can find a path parallel to a wall and follow it around the room, or around the building. Here is a wall-following mpeg movie of the robot navigating down a long hallway in the Heroy Science Building at SMU. The robot begins facing the wall and rotates to acquire a right-following mode. In this mode the left-facing Sharp detector is inactive. The robot attempts to maintain a constant distance from the wall, about 12 inches. The curvature of the turn is controlled by the distance to the wall, so that the robot makes mild corrections while following the wall and is still able to turn sharply around corners and posts and other obstacles along the path. This navigation technique is not limited to hallways with nice even boundaries. The robot can also track along the perimeter of almost any object (like for example it can circle me when I'm sitting on the floor) or even an irregular set of objects. Here is a perimeter-following mpeg movie of the robot navigating the outline of the clutter in my office. In this case the distance to the wall is automatically increased to account for the large number of IR collision detections that the robot is reading. Even without the advantage of nice flat walls for IR detection the robot is able to following the outline of the room and avoid collisions and obstructions. Most of the robot competitions that LegoBot has entered have very simple geometries and reflecting surfaces by comparison, and so its performance has been generally applauded. But it is in a cluttered, disorganized, and ultimately human environment that robots must eventually operate, and that which LegoBot attempts to pursue. Here are some mods for legobot to run in a couple of different robot competitions: the Trinity Firefighting Competition, and the DPRG CanCan Competition. Both contests use legobot's wall following behavior to navigate the robot contest course. The firefighting module includes several flame sensors and a fan for extinguishing a candle, and this contest required that a new software behavior be added to read and drive this module. The can collecting contest required no new software. A Firefighting Module for LegoBot. 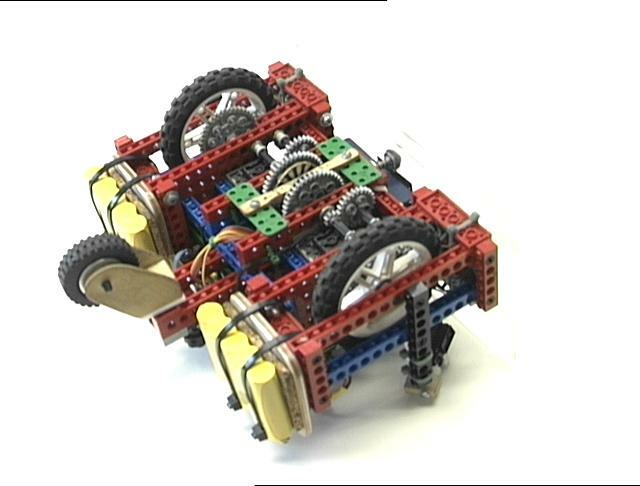 A Can Collecting Module for LegoBot. Back to my Robots homepage.